Summertime in Arizona is definitely pest season. If you don’t want to be outside during this sweltering summer season, neither do the pests that try to infiltrate your home. More households call pest control companies during this time of year than any other season. However, not all pest control operations are created equal. It is important to do your research and window shop before going with just any pest control company in Mesa that is cheap. Finding an pest control exterminator in Mesa that is top notch, offers quality services, and isn’t greatly overpriced is very important. A poor pest control job could lead to more infestations and more money spent in the future. Read on to learn more about how to size up a pest control company and pick the right one for you. Do they offer power spray? Many pest control companies treat homes with something called a backpack sprayer. This small, somewhat wimpy pest control method is usually not enough to effectively prevent a deep infestation. A pest control company that offers power spraying may be the company you should go with. Power spraying the foundation of the home is the most effective way of treating it for pests. The intense pressure behind the power spraying hose penetrates rocks and soil around the home to effectively get all of the exterminating product as close to where pests may be burrowing as possible. Power spraying is usually a preventative step- it does not necessarily kill the pests within a nest or colony. To get to the source of your pest problem, which is usually around the trunks of trees and roots of foliage, a reputable pest control company will use something called granulate. Granulate is a material that is applied to areas around trees, plants, gardens, and other spots where pests may initially get their source of food and water and where they might be breeding. A pest control company that offers granule treatment is usually a good choice. Always trust verified reviews. If a customer is deeply unsatisfied with a company’s pest control services, the Internet will likely hear about it. Check the pest control business’ website for reviews, as well as review sites like Yelp, Better Business Bureau, or Google. Family Owned Pest Control is another good source for pest control company reviews. Do they offer wall treatments? A complete and thorough prevention and exterminating pest control treatment will include in-wall treatments. Pests can infest the walls and roofing of your home fairly easily. Avoiding a wall treatment could make way for a massive and hard to control infestation. Look for a pest control company that offers in-wall treatments in which they dust a pest control product inside your walls via outlets from the outside. This will effectively kill any remaining pests trying to infest your home, and should be mandatory instead of optional. Do they have the qualifications, reputation, and experience to perform a thorough extermination? Look up information about the company or call them and ask. Do the pest control technicians all have current licenses? Are these licenses the correct license for the job they are performing? Does the company keep their staff informed of new and changed regulations and safety measures, as well as new products and techniques? Do they use IPM (integrated pest management) techniques on the job? Does the business have a certified entomologist on staff? Some of these question aren’t super important, but it can help in making a final decision between companies. It is also important to ask about how many years a company has been in business and if there have been any name changes. Sometimes faulty or untrustworthy businesses will bomb, so they end up starting a new business with a fresh reputation or just change their name. Keep an eye out for them! A company like Varsity Termite and Pest Control will have been in business for several decades and have the experiences and expertise to properly perform a pest extermination within a home. I need a great pest control company in Arizona. Who can I trust? 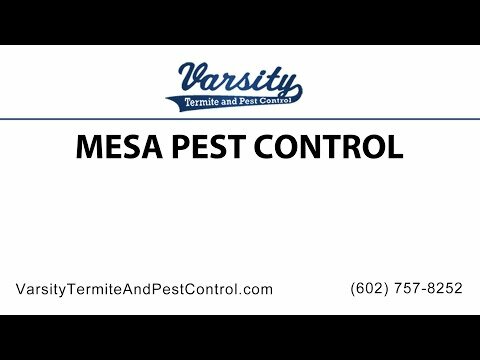 Varsity Termite and Pest Control is definitely a pest control company you can trust located in Mesa, Arizona. We offer many pest control services, include ant, scorpion, termite, and roach control. Do you need to have you house sealed after scorpions have decided to hang out inside? Are you sick of turning on your kitchen light to see cockroaches scatter underneath your fridge and cabinets? Everybody has to deal with pest issues at some point, but you don’t have to deal with it alone. Give Varsity Termite and Pest Control a call today to get on the road to a pest-free home.